Lock app icons and widgets on display page. Does any one no how to lock a app icon or widget once it is placed on one of the main display pages. I find it annoying when I have a icon, group of icons or widget move to another display page by an inadvertent screen swipe. You can "lock the desktop" in Nova Launcher too. Thanks to both of you for the help. I am using Nova Launcher but could not find a way to lock the desktop. But knowing it could be done and where prompted me to dig deeper and I found the Nova lock. I am happy now. It would have helped me if you told me how to do this...my search continues. Okay, so for the next person...in Nova Launcher settings go to DESKTOP/ADVANCED/LOCK DESKTOP. Works awesome (has to be Nova Prime I believe...which is absolutely worth the $5. 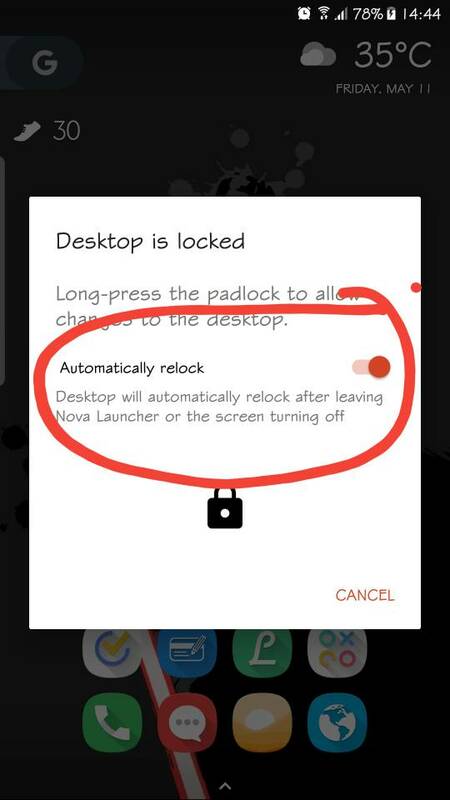 Have you tried in Nova settings - desktop - lock desktop? I know this is an old thread but does anyone have a way to make a shortcut to lock and unlock the desktop from the desktop. It's a hassle to have to open Nova up every time you want to change something. It's already there Long press on the screen on the desktop, you will see the desktop is locked popup. There will be a padlock icon on it. Long press the padlock. The desktop will be unlocked. Chanchan05 is right, that's the closest to a shortcut that you can get. I tried a few times in the past to create a proper shortcut from Nova Activities and such and didn't find anything. Wow I've never seen that. Thank you,I'll check it out. Just for fun I fired up Apex, which I've not used for years and it's been kind of fun. I've always said it would be the ultimate launcher if you could combine the 2. Just a few things here and there on both of them. I can't count how many times I've gone through activities thinking I might just be missing it. I've never seen the above method in any docs or anywhere. I'll play with Apex for a few days and then return to Nova. so there's no widget/shortcut we can make with Nova? Why would you need a widget if you can just long press anywhere? Even in the app drawer? It locks itself soon after. It's pretty much impossible to forget. Or right after opening another app that's not Nova. Yes. But I spend sometimes hours changing things around and I usually fall asleep before remembering to lock desktop. This is why a shortcut on home (to lock desktop) would be easier not to forget. Maybe if I reinstall 'shortcutter" app, but all roads lead back to lack of knowledge and doing it in Nova would be more exiting. I still don't see the problem. Doesn't matter how long it takes you to move things around. It locks itself up again when the screen gets turned off. If you fall asleep, when the screen turns off, the desktop gets locked.. How can you forget something you don't even need to do? ok, now is there are timer? because I might be mistaken, but I don't remember it ever locking desktop after the phone turning off. but apart from the timer, you've been very informative, thanks. but once again, in my situation, a timer to lock desktop after inactivity,like an hour, would be ideal. No. There is no timer apart from the timer before your screen turns off automatically. But that also means you're not using it anyway.